I sell Golden (Superman #1), Silver (Amazing Fantasy #15), and Bronze age key books (Hulk #181)... Super high grade book that is over 40 years old now! Want the best looking copy? This book is unrestored (unless otherwise stated above). Included is a free CGC sized mylars (to protect this book or your other valuable CGC cases). 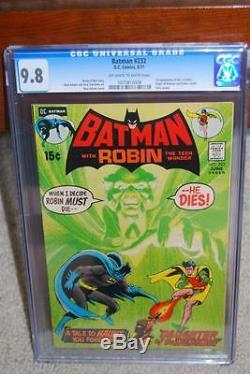 The item "Batman #232 CGC 9.8 DC 1st Ra's Al Ghul! 108 cm bo" is in sale since Saturday, August 16, 2014. This item is in the category "Collectibles\Comics\Other Comic Collectibles".